This bold, pioneering book explores rites of passage in America by sifting through the accounts of influential thinkers who experienced them. Arthur J. Magida explains the underlying theologies, evolution, and actual practice of Jewish bar and bat mitzvahs, Christian confirmations, Hindu sacred thread ceremonies, Muslim shahadas and Zen jukai ceremonies. 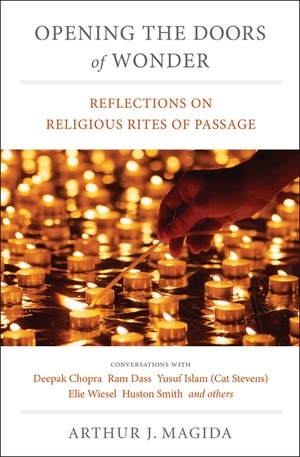 In rare interviews, renowned artists and intellectuals such as Nobel laureate Elie Wiesel, holistic guru Deepak Chopra, singer Yusuf Islam (Cat Stevens), actress/comedienne Julia Sweeney, cartoonist Roz Chast, interfaith maven Huston Smith, and many more talk intimately about their religious backgrounds, the rites of passage they went through, and how these events shaped who they are today. Magida compares these coming of age ceremonies' origins and evolution, considers their ultimate meaning and purpose, and gauges how their meaning changes with individuals over time. He also examines innovative rites of passage that are now being "invented" in the United States. Passionate and lyrical, this absorbing book reveals our deep, ultimate need for coming-of-age events, especially in a society as fluid as ours. Arthur J. Magida is Adjunct Professor at Georgetown University and author of The Rabbi and the Hit Man, Prophet of Rage, and How to Be a Perfect Stranger. 3. Chinua Achebe: What Makes Someone Give Up Their Religion? PART TWO JUDAISM: WOULD ANNE FRANK SING KARAOKE? 7. What, Really, Is a Man? Epilogue: Would Anyone Riding by on a Horse Even Notice?